Today is my youngest daughter’s birthday. Her proper name is Adieren, pronounced a-dear-un. This name came about because when she was born it was her father’s turn to name the baby. He wanted to name her Adelaide and call her Ad but I vetoed that! He later said that he looked up a better name that was German: Adieren which meant dear one. I was a sucker for this kind of sentiment and she was tiny: under five pounds. The doctor said, “she is little but she sure is strong.” I quickly agreed. Later when Addie was in college she studied German and informed me that her name in the dictionary meant: to ad on. Just like her father! We never fought about anything, he would just go underground and get his way regardless. He passed away in 1985 so I couldn’t come after him but I would have and this would be our first fight! By this time I loved the name anyway and today I am filled with gratitude and sweet memories of her. she met and married her fly boy Navy Commander and they have lived away from me ever since with only an occasional visit. Of all my six kids I always thought she would live near me and if Bill was not such a great guy I would wish that she did. But when you are in the Navy you go wherever they send you and she is wonderful in her devotion to him and their two girls. But I remember the tiny reddish blond curls flying in the breeze as she sailed down the hill on her bike. I remember the floppy hat on top of those curls and the pins, buttons, and writing on it. I remember the miss matched outfits she insisted on wearing and the trails in the woods that she and her sister Holly made and played Robinhood. I remember her and Sissy running through the snow, then warming up in the house only to run again. I remember her as the official chicken egg hunter when the hens had the audacity to lay eggs in the bushes. She named them Miss Priss Pot, Miss Chicken Hen, and other names that I have forgotten. I remember when the kids on the school bus tried to take her lunch money she held up her first two fingers in a V shape and said, “How would you like to have this up your nose?” I remember all of the help that she gave me with Billy without being asked. She was a fearless, smart and strong adventurer. Still is, and if she was here right now I would wrap her in my arms and tell her how lucky I feel that she is my daughter. Instead I can only say I hope that she has a wonderful day with her sister who traveled by train to be with her on this special day. Have fun and be careful. I love you both always. 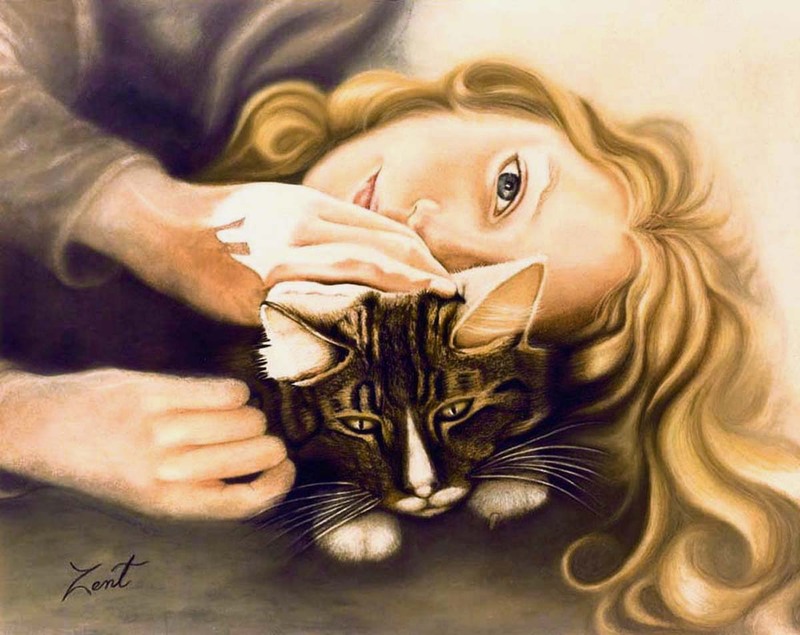 This entry was posted in Original artwork by June Pauline Zent, True Stories About Artwork, Uncategorized and tagged art, artwork, family, human intrest, pets, soft pastel, true stories, word press. Bookmark the permalink. That was a wonderful post, you’re a great mom. And I LOVE the painting, its so soft and innocent. I think that;s why I feel so close to you Maggie. You have to live it to know it. I am so glad that you think I am a good mom. I wonder sometimes because of the attention that had to go to Billy. But they are great kids and i am so lucky. I am sure that you feel the same way. Thanks again for your hugs! Hugs back! Beautiful painting and story (I love the story of how she got her name!). Yes, I don’t regret it now and sort of forgive her father. Thanks for liking the painting and the story. Thank you Letizia for the compliment and for taking the time to come to express it! Thank you Manu for having faith in me as a mother. It has always taken first place in my life. I will pass you wishes on to Adieren and again thank you and your girlfriend! It was so touching to read this. A post on how a mother feels about her daughter when she grows up and lives away from her,visiting occasionally due to the family ties and situations. How a mother feels proud of her daughter about whom she remembers each and every small aspect of hers. I felt how my mom would be thinking. You are such a loving person,it shows in your paintings,the softness of your strokes show the compassion that you create with colours and shades. …as if filling the voids of the painting ‘s gaps with touch of your love.My best wishes to your dear daughter on her special day and thanks for sharing such a warm story of your life wth us. I am blushing Soumya! What a wonderful compliment as only a poet could write I am totally grateful. I know that Addie will see your comment and it will make her happy. thank you so much!! Soumya, I am so grateful for this honor especially coming from you and I will find a way to thank you properly. It is such a joy to have the support of one of my favorite bloggers and a stunning poet. Thank you so much! Oh, thank you so much for the great compliments but I am the lucky one to have her. I like the name too —now and would not have any other. I will tell her happy birthday for you and I am sure she will see it here too. Thanks again for your great comments! I think Adieren is a beautiful name, no matter what it means. I love the painting and the story. I met Aunt Bettes Addie, and she told me about yours. I wish I could have met all my cousins kids, but that wasnt to be. Everybody is so far appart now, but can keep in touch on Facebook, even if they havent met in person, it is nice to know we have relatives and the family tree keeps branching out. Yes, Sharon I also love the name and did when I first heard it. It was not the sound of the name that got my anger up as I am sure you know. Facebook is great for keeping up with family but I am so proud of you coming here where writing more than one sentence is the norm. I feel that blogging is much more personal and gives you many more opportunities to share with friends ans family. It also does not disappear after a day. Thank you so much for being so loyal and keeping in touch. Mom, thank you for the sweet blog post and birthday wishes! It’s great to have Holly here and some time to laugh together. No matter how far away I’ve lived I’ve always felt very close to you. I strive to be the person who deserves the love of my family. No one could ask for more sweet Addie. Yes we do have a bond that distance cannot affect and your whole family feels the good vibrations that you send. When ever their is a problem you are the first one we think of for advice and you do have the love of everyone who knows you! I could not be more proud! If I only had one comment on this post I would still be happy because yours is so great. You are what I look to the most. God help me if I write one that you don’t like. Thank you so much! I know that it is hard for you to be on the computer which makes it even more special! I love you more! Yes, she still has lots of spark. Thank you Livesinstone for this great compliment. It was a wonderful birthday for her and seeing all of these comments was a big part of it.. Thank you for being a part of it!!! That was a wonderful post, you’re a beautiful mom! Thank you Stefan for your wonderful compliments! So glad that you like the post! You just need a few lessons from me. You are so creative you would do great!